I have a bone to pick with movie distribution: Why can't we see documentaries on the big screen when they're released? 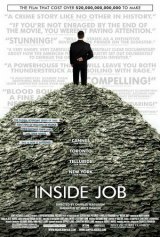 If ever there was a timely documentary, it's "Inside Job" written and directed by Charles Ferguson (Sony Pictures Classics, 2010, 109 minutes, PG-13, released on DVD March 8, 2011) and the winner of the feature documentary category at the recent Academy Awards ceremony. I've read and reviewed several books, maybe even a dozen, about the financial meltdown, the villains, the causes, the failure of the government to regulate, the power of the lobbyists -- who seem to favor and reward with campaign contributions Obama as much as they did Bush and Clinton -- and the guilty people escaping with their fortunes intact while ordinary people around the world were scammed. "Inside Job," narrated by Matt Damon, covers all these topics thoroughly and adds a dimension I haven't seen covered adequately in the books I've read: the co-opting of academic economists by financial institutions that pay them megabucks to shill for their fraudulent products. If I'm being too harsh on the likes of Goldman Sachs, J.P. Morgan Chase, Lehman Brothers, A.I.G. and the rest of the scummy bunch, so be it. Ferguson interviews several academics and to a man -- and to a woman, counting Professor Laura Dyson of the University of California at Berkeley, a favorite of Bill Clinton -- they saw nothing wrong in touting deregulation and writing articles for financial firms for fees that would support me and a couple of my friends in style for a year. "Inside Job" focuses on changes lin the financial industry in the decade leading up to the crisis that erupted full blown in 2008. I was especially pleased to see Ferguson mention one of the contributing factors to the meltdown, the repeal of the 1933 Glass-Steagall Act that separated commercial and investment banks. Glass-Steagall worked well for almost 70 years and should have been retained. Glass-Steagall was an impediment to the new financial products the scamsters wanted to foist on the public, so it was repealed in the Clinton Administration, in 1999, with Treasury Secretary Robert Rubin, a product of Wall Street, one of the leading cheerleaders. It was replaced with the weak Gramm-Leach-Bliley Act (AKA: the Financial Services Modernization Act of 1999), which removed the Chinese wall separating relatively safe commercial banking from highly speculative "investment" banking. The Gramm in the bill is Republican Texas Sen. Phil Gramm, now thankfully a former senator, whose wife, Wendy, was a former chair of the federal Commodity Futures Trading Commission and later a member of the board of Enron, where she picked up gigantic bucks for her efforts at the failed Houston company. Talk about conflicts of interest! This kind of "modernization" we don't need! In addition to repealing strong legislation like Glass-Steagall, "Inside Job" covers the revolving door conflicts of interest of people like Wendy Gramm, Martin Feldstein and many others -- conflicts of interest that Ferguson says are not properly disclosed. Then there's the matter of the three rating agencies -- Standard & Poor's, Moody, and Fitch -- that gave the highest rating -- AAA -- to subprime derivatives that turned out to be toxic assets, an oxymoron if ever there was one. Ferguson and his outstanding production and writing and research team makes it possible for the average person to at least get a grasp on the fraud involved in such products as the derivatives, as well as the scamming that went on at Fannie Mae and Freddie Mac. The housing bubble is properly blamed for contributing in a major way to the superheated market, which collapsed so spectacularly in 2008. "Inside Job" is on target again when it shows how the high risks underlying subprime lending by Countrywide Financial and many other financial institutions were passed hand to hand like a red hot steel ball from investors to other investors, who believed the phony ratings from the Big Three and ended up losing all their money. Institutions like the Mississippi retirement fund ended up the losers, as did the entire country of Iceland, whose financial meltdown is shown in the film's cold open (starting the film before the opening credits). Ferguson says we're not getting "Change We Can Believe In" -- an Obama campaign slogan, because President Barack Obama not only hasn't unleashed federal agencies on the scamsters, he has ended up appointing or reappointing many of the same people Ferguson says were behind the meltdown in the first place -- among them Treasury Secretary Timothy Geithner, economic adviser and former treasury secretary Larry Summers and Fed Chairman Ben Bernanke. Ferguson ends his wonderful documentary be saying that Obama's much touted and recently passed "financial reforms" are so weak that we're in the same place we were before the meltdown, with an unchanged underlying system. Countrywide's Angelo Mozillo isn't in prison, nor are his fellow fraudsters, Ferguson points out. I wish Ferguson had included an interview with Rep. Ron Paul (R-TX), who is highly critical of the opaque Federal Reserve System, but he did have an impressive lineup of people who were interviewed, including NYU economics professor Nouriel Roubini, AKA "Doctor Doom." To my knowledge, nobody has hired Roubini for big bucks to tout derivatives or deregulation! Get a copy of "Inside Job" and look up the study guide that goes with it (Link: www.insidejobstudyguide.com). If you thought the meltdown was bad, you ain't heard nothing' yet! The entire system was -- and is -- rotten to the core.